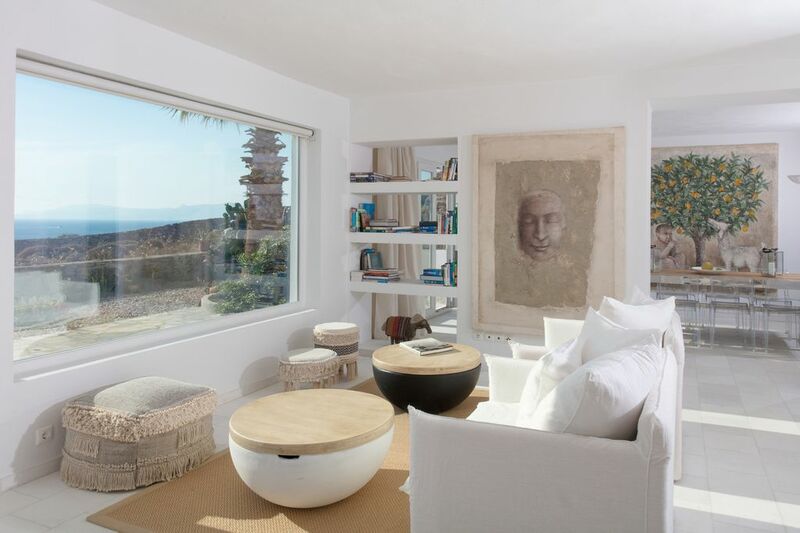 Villa Aristotle is ideally located south west part of Mykonos Island, facing sunset, Del;os island & Aegean sea, peace, quiet & privacy with contemporary standards of comfort & new marble bathrooms! sitting area with sofa and plasma TV with foreign channels, & stereo music installation, second area with large window has sitting area with 4 large armchairs, connects to dining area for 8-10 persons, with small well equipped open plan kitchen. Guest bedroom (lower level) with king size bed, A/C en-suite marble bathroom with shower, toilet/bidet. Opening up with French Doors onto small terrace & connecting to the pool. Sea view. with a king size bed, A/C, en-suite large marble bathroom with Jacuzzi bathtub (hydro massage, aero massage, light therapy), shower, toilet/bidet. Panoramic windows to the Aegean and sunset, (French doors with a view to the famous Agios Ioannis beach?). Direct access from the balcony to the pool area. 2. Second Master bedroom (26m2 appx). with a king size bed, A/C, en-suite large marble bathrooms with jacuzzi bathtubs (hydro massage, aero massage, light therapy), showers, toilet/bidet. Independent Guest bedroom reached a few steps up, access through the garden with: king size bed, A/C, en-suite marble bathroom with shower, toilet/bidet. Panoramic window to the Aegean and sunset. (?French doors with a view to the famous Agios Ioannis beach?). Direct access from the balcony to the pool area. At the entrance of villa; second outside sitting & dining (wind protected) area for 8-10 persons. I live on Mykonos now 33 years amd am the owner & general manager of travel agency Mykonos Accommodation Center. In one the most beautiful locations on the island: Aleomandra is a villa residential area facing Delos island, sunset and the Aegean Sea! small but well equipped open plan kitchen: with stove/oven, large fridge, dishwasher, microwave, nestle coffee maker, toaster..all necessary pots & pans, dishes, glasses.